Learn about major announcements, as well as highlights from CF Camp and Day 1 sessions of this year's summit. 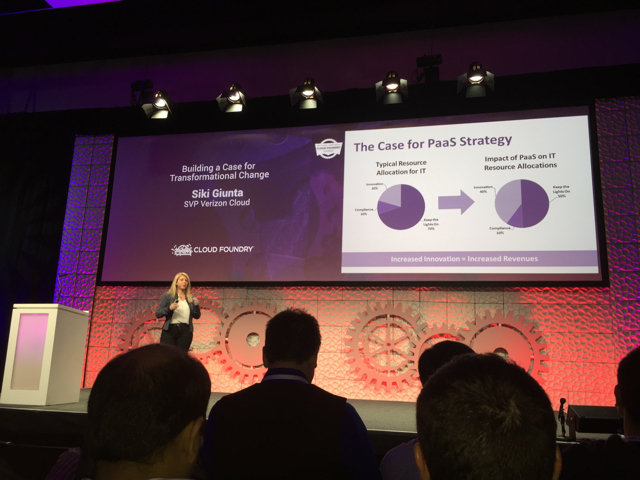 This year, the Cloud Foundry Summit introduced a stronger focus on community diversity and closer collaboration between its ecosystem members. 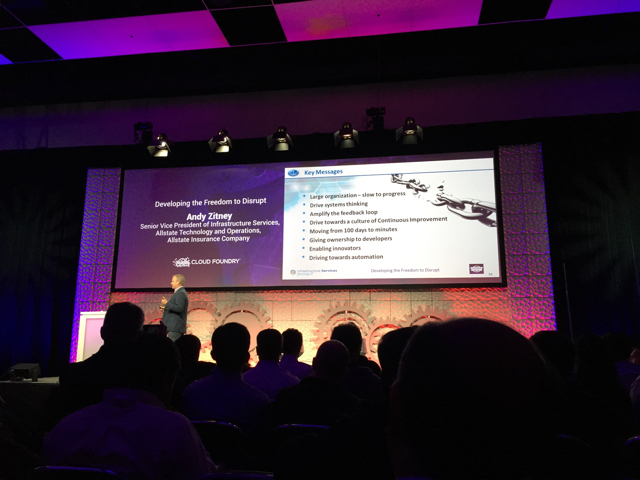 New partnerships, integrations, support for a broader technology stack, etc. Just like a year ago, we recap what was happening this Monday at the Santa Clara Convention Center, which was themed in the cyberpunk style. 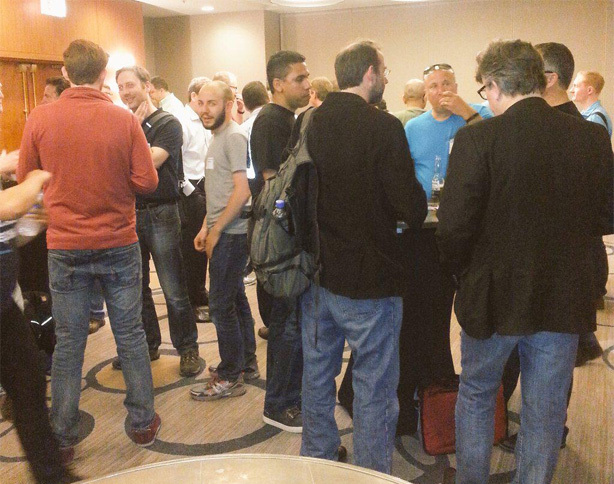 For many of us, the Cloud Foundry Summit started a day earlier, on Sunday, at the CF Camp held by Dave Nielsen. A lot of legendary speakers could be met in the hall or during the unconference sessions. This “warming” event brought a lot of fun and useful debates at the same time. Browse through the #CFCamp hashtag, if you want to see its highlights. The conference itself kicked off with bringing some news and releases. 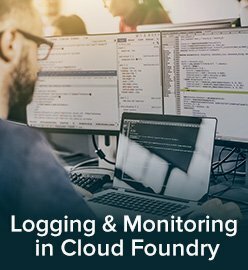 The CF Foundation has been joined by six new members: Apigee, Bloomberg, Cloudsoft, Huawei, Mirantis, and New Relic. 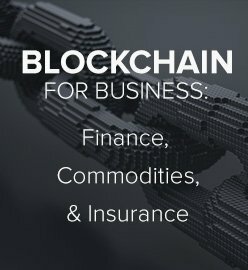 Congrats, this brings the total number to 40+ companies! HP Helion Development Platform has been enhanced with the .NET support. 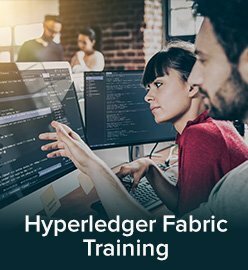 HP is also donating a sizable amount of code to the CF incubator (including Visual Studio Extension, MS Buildpack, .NET SDK for the Cloud Controller API, Windows-based DEAs, and a SQL Server service broker implementation). ActiveState has released Stackato 3.6 with support for Docker images (called “Docker Apps”). 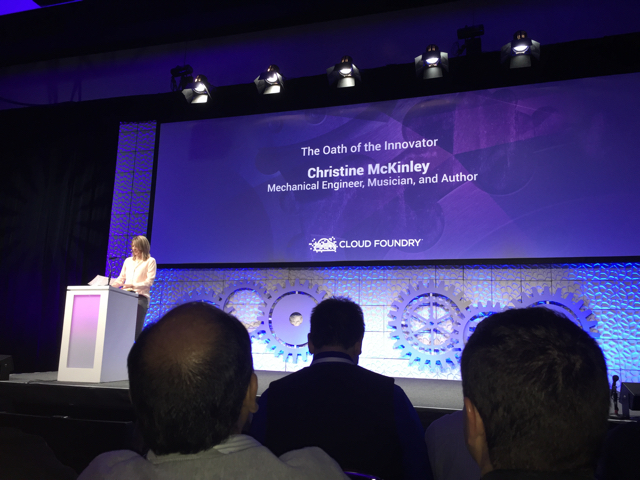 GE is launching the Industrial Dojo program (6–12 weeks) that allows developers to master Cloud Foundry by collaborating with other experienced CF engineers. 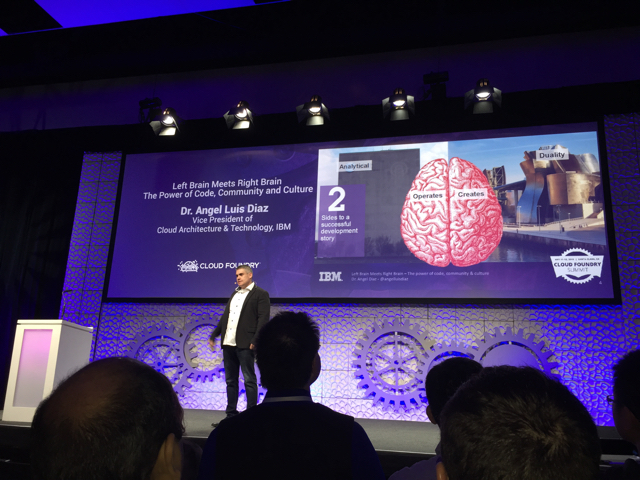 IBM established another independent CF Dojo at Raleigh (NC) and introduced new Bluemix services. 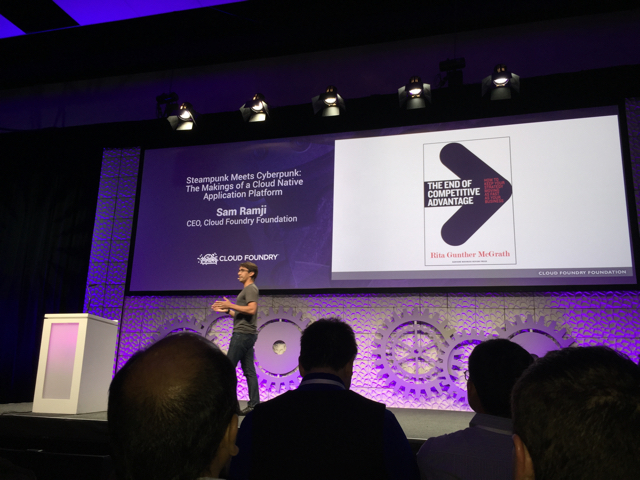 Pivotal and Mirantis announced a partnership aimed at delivering Cloud Foundry on OpenStack. 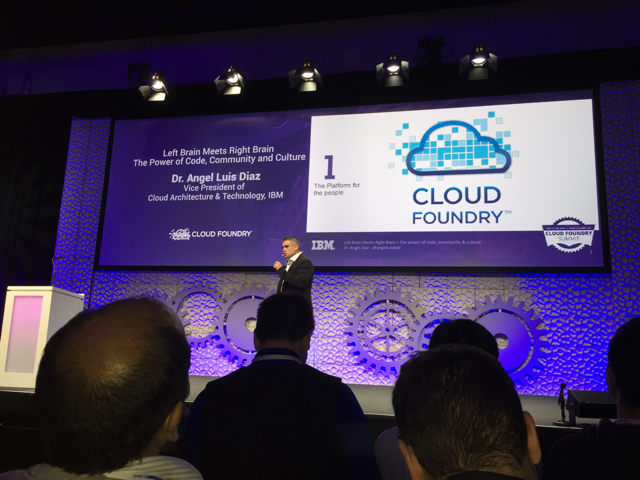 The opening talks of the summit focused on building a strong community and the cultural side of using Cloud Foundry. The first keynote was delivered by Sam Ramji, CEO of the CF Foundation. 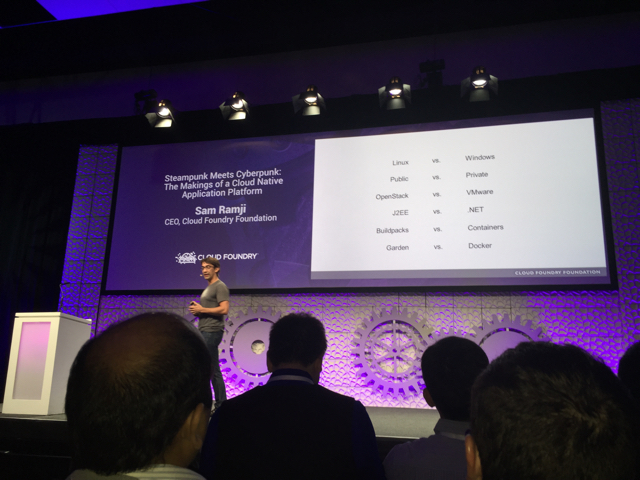 He spoke on how Cloud Foundry provides a choice of technologies and freedom to innovate. 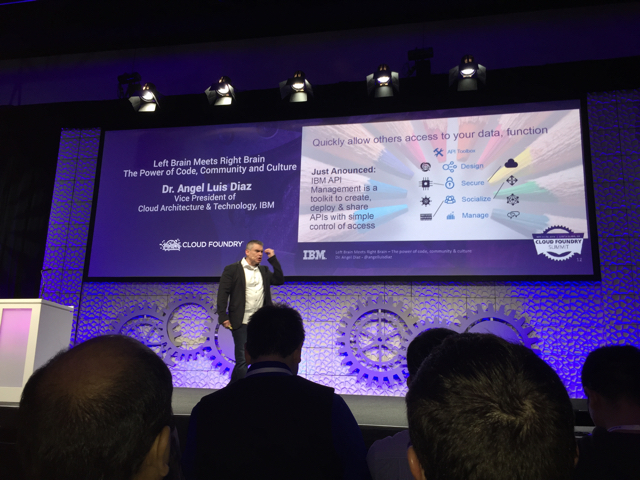 Angel Diaz from IBM continued with a talk on the culture behind Cloud Foundry, covering the characteristics of a healthy corporate environment that promotes innovation. Christine McKinley, a mechanical engineer, a musician, and an author, amused everyone with funny pics and brilliant geek humor. According to her, open-source communities got it right what governments and hippie communes have strived for. 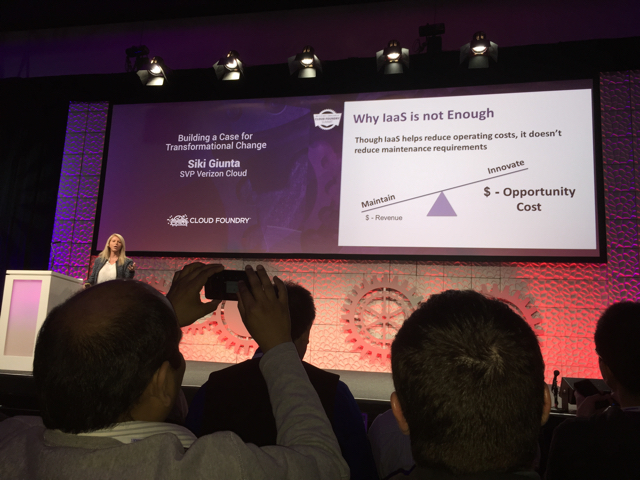 Siki Giunta from Verizon spoke about how Cloud Foundry impacts resource allocation in a large enterprise. 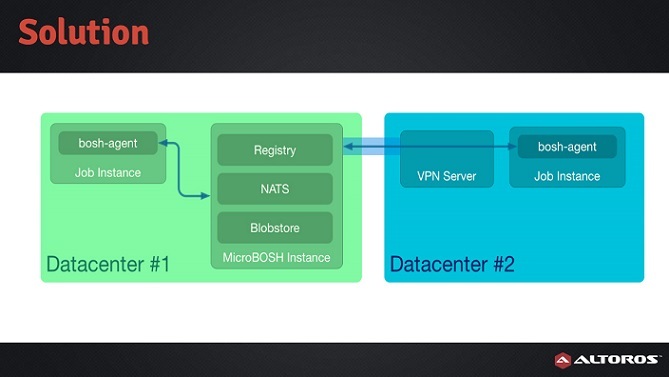 A PaaS system adds a level of automation on top of IaaS, balancing many of its downsides. This helps to economize and/or find resources for more growth and transformation. 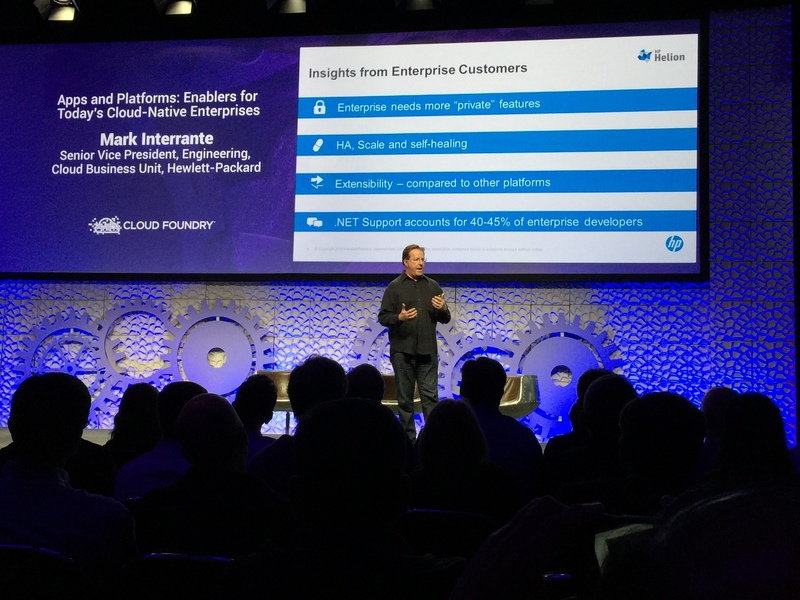 At the evening keynotes, Mark Interrante from HP officially announced the deep Windows and .NET support added to HP Helion Dev Platform 1.2. According to Mark, 40–45% of enterprise customers are running on .NET. 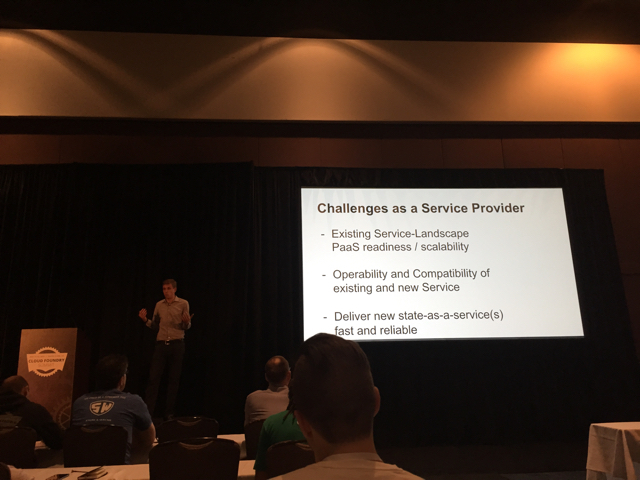 After that, Andy Zitney from Allstate shared why the company he works at—which is nearly a hundred years old—chose Cloud Foundry as the platform for change. 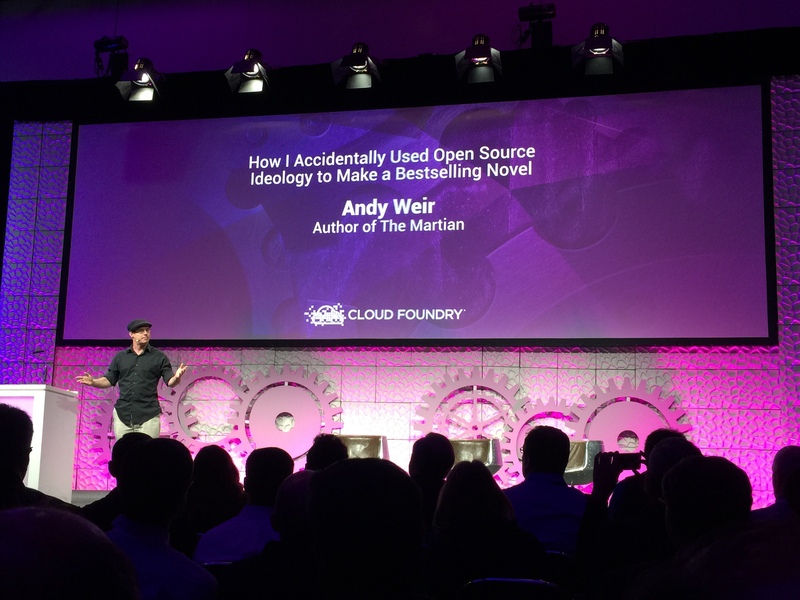 The final keynote by an author Andy Weir told a story of how his bestselling book, “The Martian,” was open-sourced for the good of the community. Surprisingly, although it was out for free, people still wanted to pay money for it on Amazon. 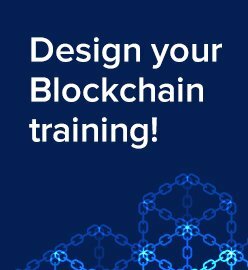 It would be impossible to attend and cover all of the sessions presented at the CF summit. 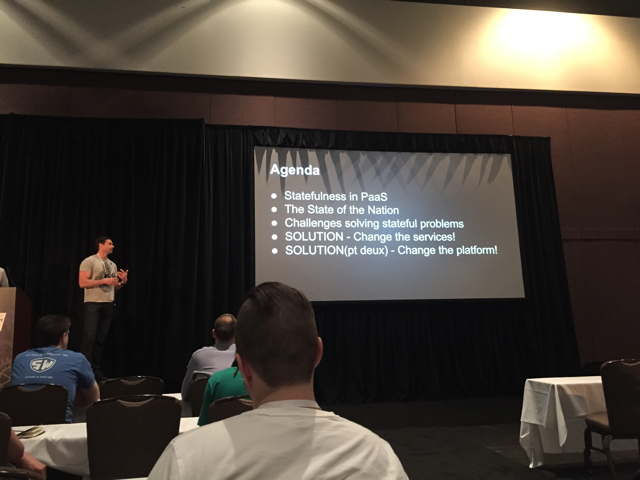 Still, here’s our pick of talks that our team liked and was able to attend. 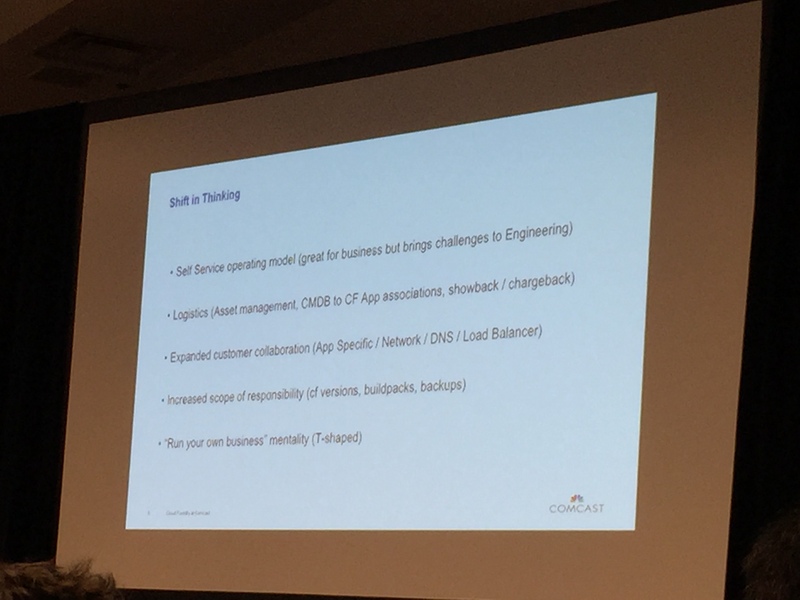 A media giant Comcast shared their experience with running Cloud Foundry. 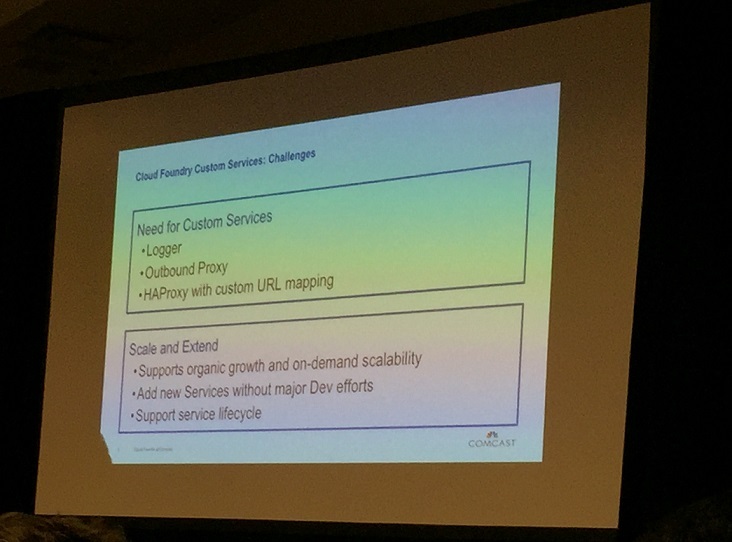 According to Comcast’s engineers, a PaaS gives them the freedom to use their back-end services. The first two services they created were Logger and Outbound Proxy. The main challenge they had was with custom URLs. 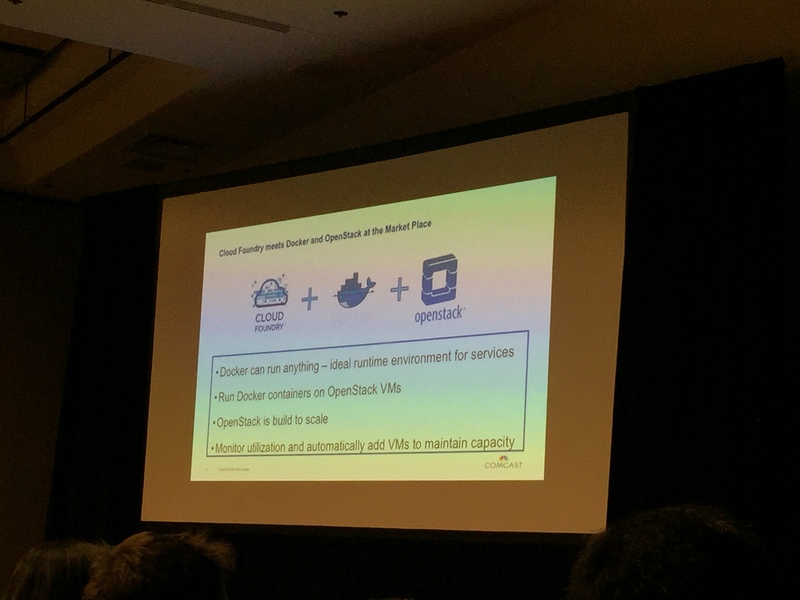 Comcast’s cloud platform is based on three building blocks: OpenStack, Cloud Foundry, and Docker. As many other companies, they chose Docker because it provides portability and the right level of isolation. The talk also touched upon the cultural side of Comcast’s transformation. Their major goals were to change the mentality of their teams and lower barriers for product development. 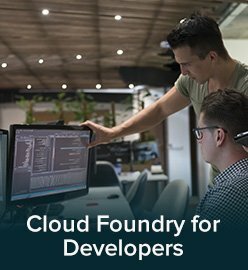 Thanks to Cloud Foundry, a self-service model was introduced, so Comcast’s developers, engineers, and architects now work closer together. 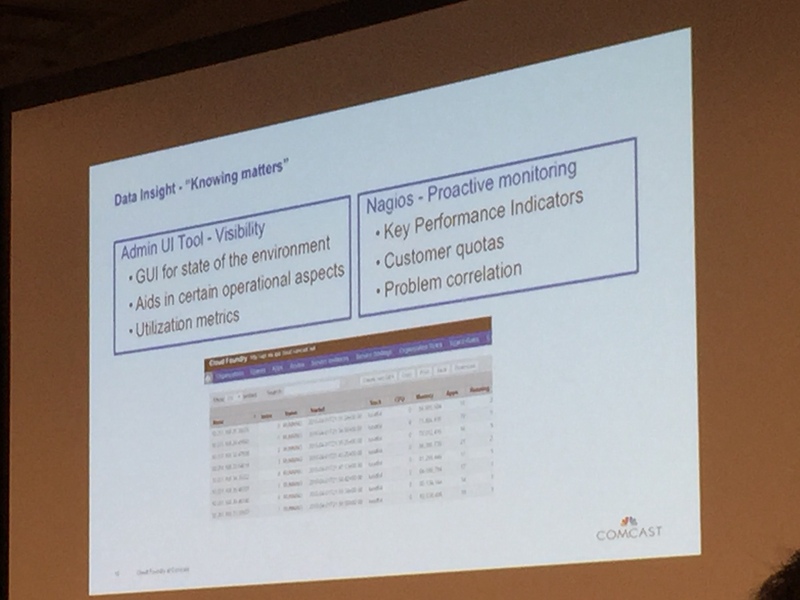 Neville George, Sam Guerrero, Tim Leong, and Sergey Matochkin listed some of the tools that Comcast uses for managing Cloud Foundry, e.g., for proactive monitoring (see the slides). 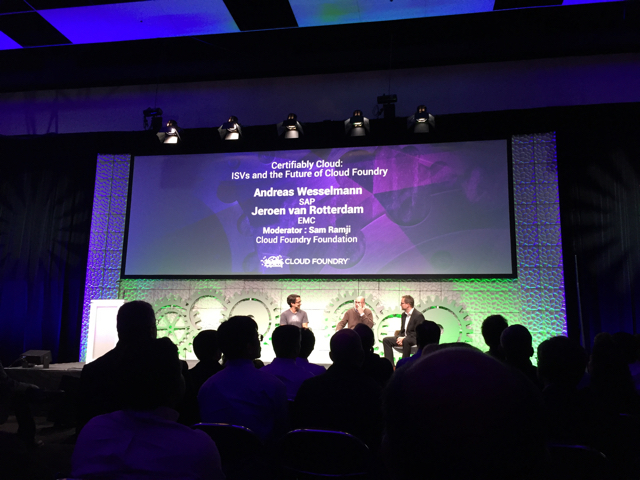 Finally, the speakers explained how Comcast trained their developers to use Cloud Foundry. 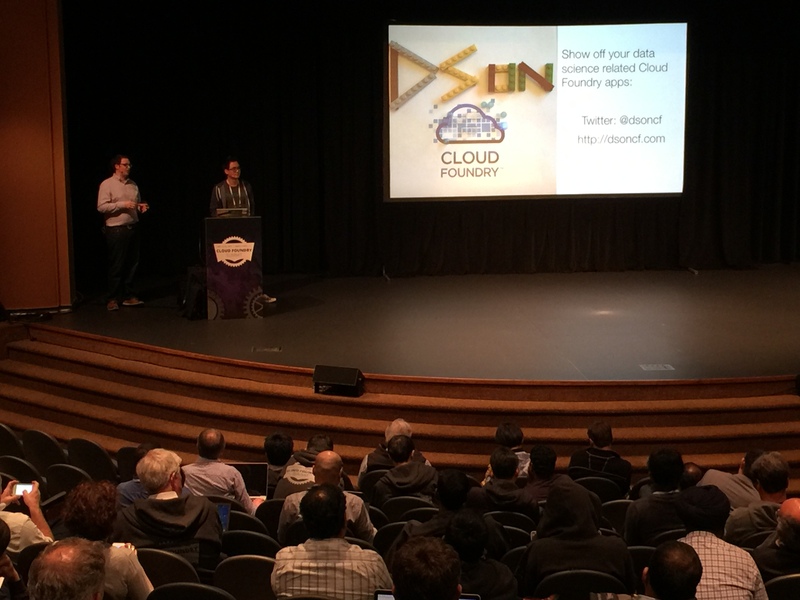 Ian Huston and Alexander Kagoshima from Pivotal spoke on how data scientists can employ Cloud Foundry to work with big data. 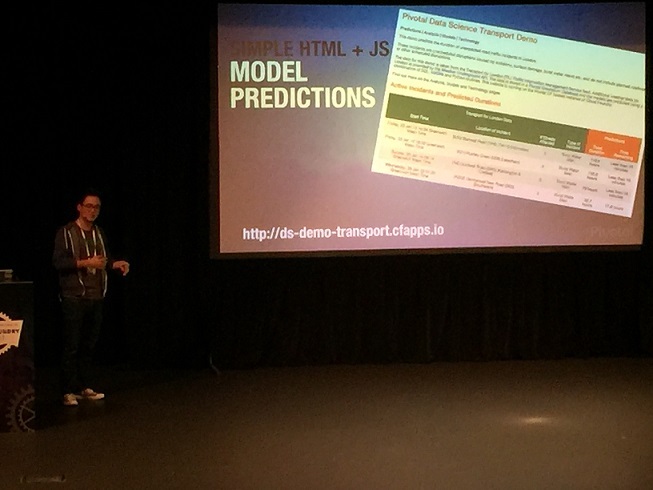 Below, there’s the architecture of the prediction API. 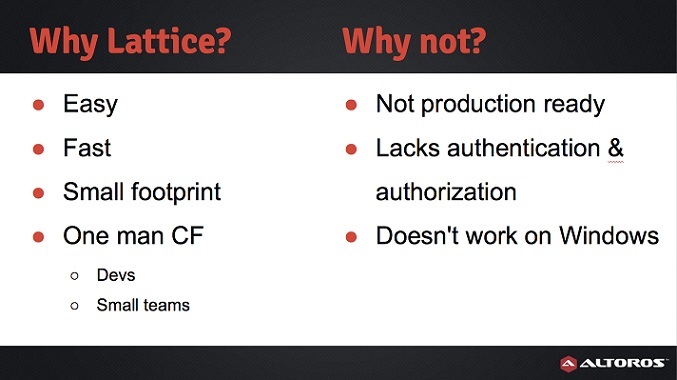 The slide below provides some insights into deploying models to Cloud Foundry. 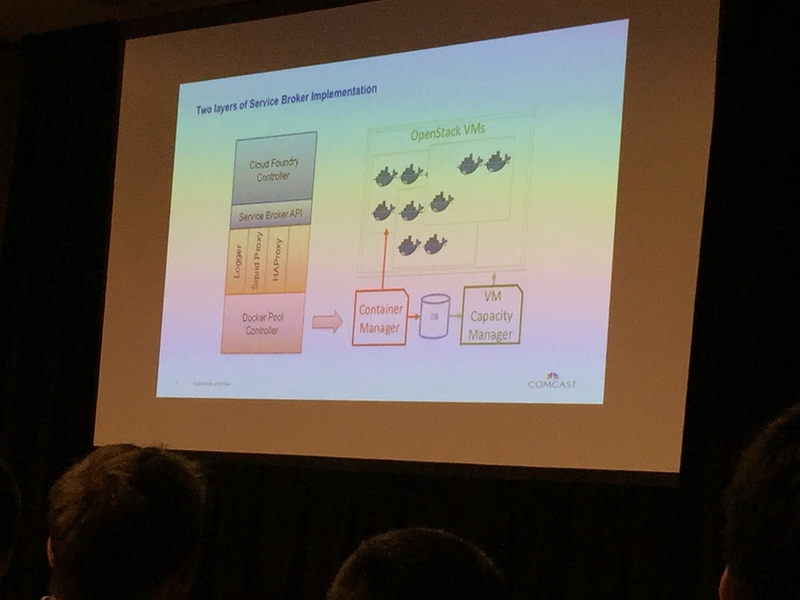 This session by Colin Humphreys from CloudCredo and Marco Hochstrasser from Swisscom was about the current issues with pushing services and data to Cloud Foundry. 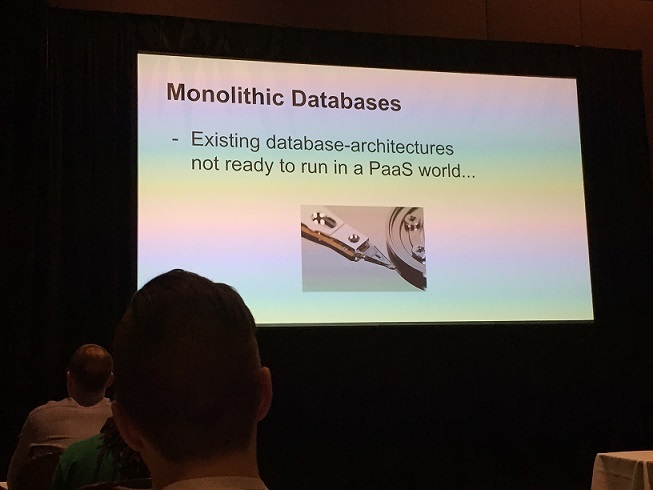 According to Colin and Marco, many services—such as monolithic databases—are simply not made to work in the PaaS world. Currently, a single BOSH deployment can only work with a single cloud, but some companies need multiple, geographically distributed data centers and use different cloud providers. 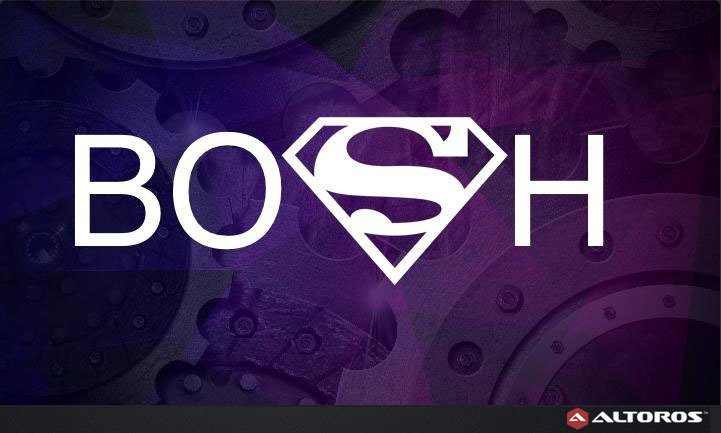 This means they have to install BOSH in each data center and use additional computing resources/team efforts to provide fault tolerance. 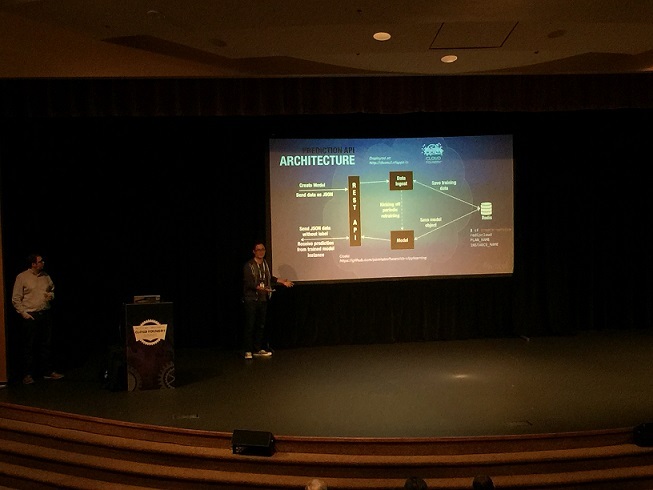 This session by Alan Moran and Alex Lomov of Altoros elaborated on an architectural solution for extending the functionality of BOSH Director and building BOSH plugins to automate deployments to multiple clouds. 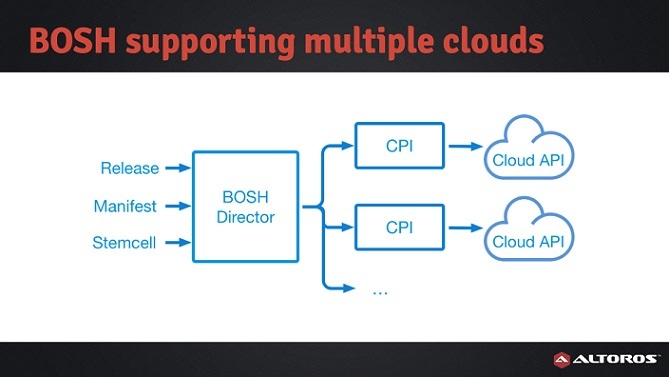 Alan expained why one may want to use BOSH with multiple clouds, how BOSH works with an IaaS, and how to make BOSH work with multiple clouds. 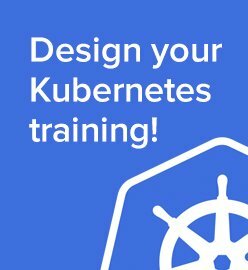 The solution involves replicating a Cloud Foundry deployment, distributing workload through a GeoDNS, and deploying apps on both CF clusters—all with BOSH! 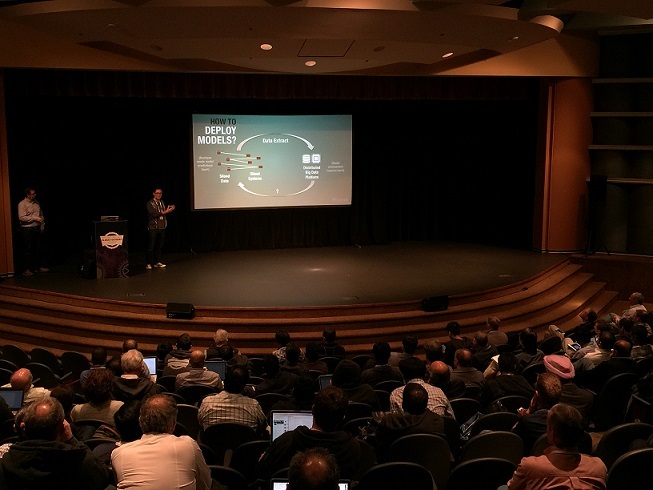 Another session by Juan Pablo Genovese and Aleksei Zalesov of Altoros featured an overview of Consul, a fast and simple HA service discovery tool shipped with Lattice. 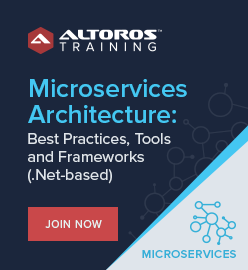 The second part was a demo where Juan Pablo used Consul to discover and bind a MariaDB service to a microservices app running on a Lattice cluster. 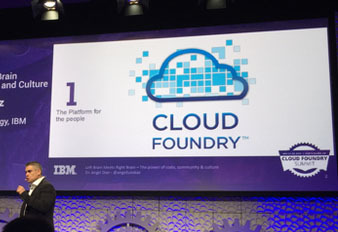 At the summit, there was also a hands-on demo of Cloud Foundry delivered by Dave Nielsen. 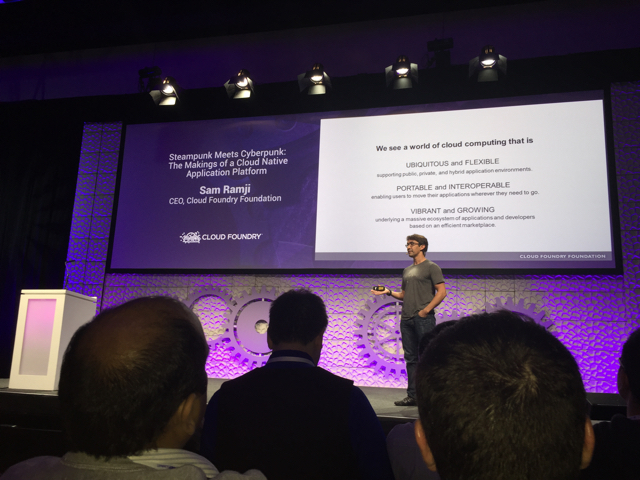 He briefly showcased how to run “Hello, world!” on Cloud Foundry just in 30 minutes. During the session, Dave explained how to deploy a Web app to Pivotal Web Services or IBM Bluemix and then bind it to a database. 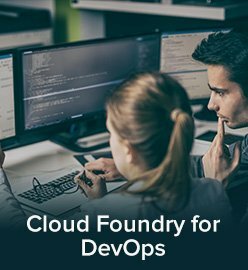 Dave is giving a deeper Cloud Foundry training on May 13, right after the CF Summit. 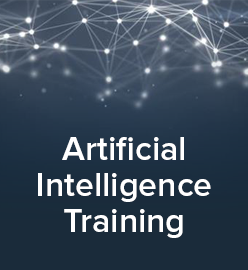 As a sponsor of this training, Altoros can provide discounts to the summit attendees. To get one, visit us at booth #113 and ask for 25–50% off! Other sessions were also amazing. Dr. Nic Williams talked about version probs with Cloud Foundry, how OpenStack doesn’t work, spiff trouble, etc. 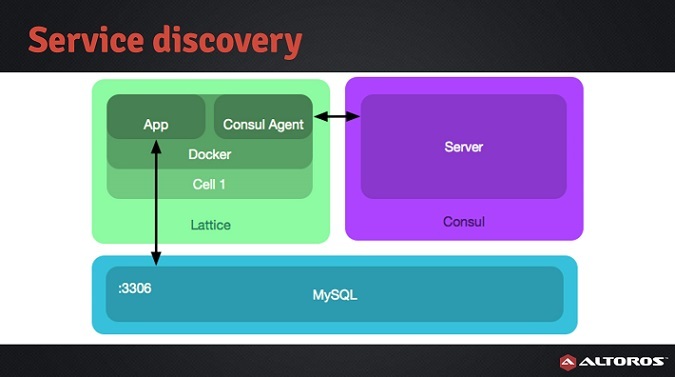 James Bayer elaborated on how their team is working to get Lattice to work with droplets, not only Docker images. I wish we could attend everything! That’s it for day one. Day 2 is already in progress and is also a blast. See you there! 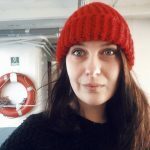 This recap was written by Sophia Turol and Alex Khizhniak with assistance from our Cloud Foundry team. *All photos are courtesy of Altoros.